May has come back around, quicker than ever for my second year of A-Level exams, and also for many other people’s exams. As soon as May hits, we’re in the depth of exams until mid-June. The stress is completely on now and I’d like to give some tips on how to keep calm and how to cope during exam time, that have previously worked for me. The first thing I suggest to keep calm is to work out when you are available to revise, and giving yourself days off revision. I made a timetable from the 3rd of March to the 16th of June, when my exams finish, working out when I had plans and when my exams were. While revising, if you begin to get stressed, don’t keep revising. I’ve learnt this is the worst thing possible you can do! If you stress while revising, it will just make you more stressed. Take a breather, watch some TV or read some blogs, whatever helps you relax. Then go back to it when you’re feeling ready to. 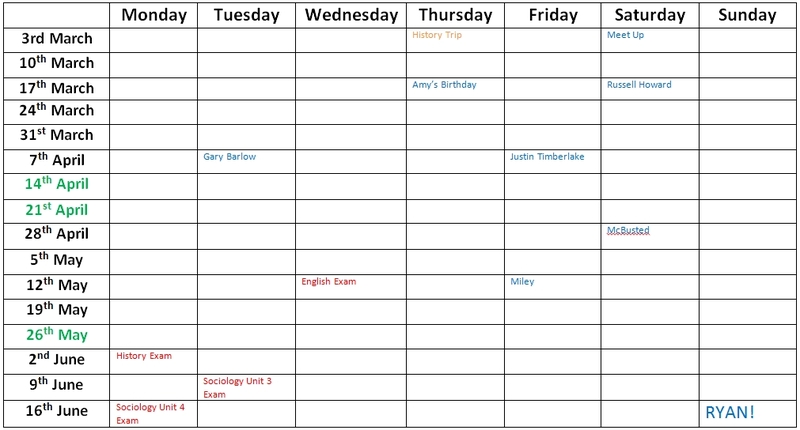 The timetable I made looked like this below, before I printed it off and wrote all over it. I recommend also stocking up on revision food. You could take it like I do, if you’re a chocoholic this is an excuse for your boyfriend/parents/brother to buy you chocolate (especially dark chocolate, as it lowers your cortisol levels and boosts your brain power. My favourite is Cadbury’s Bournville!). Or, if you prefer to eat healthier, you could opt for nuts, pumpkin seeds or anything they can pack in a graze box! You can also add broccoli to your meals as that increases brain power too. If you’re stressing a lot over your exams, you can use Kalms or Pro Plus. I have personally used these as I feel Kalms do actually make you feel a lot more calm, and a lot less anxious, and Pro Plus helps me to stay awake during that ever so boring revision! If you have any questions or anymore tips on what you do, please do comment below. Next Post What I Do On Exam Days!